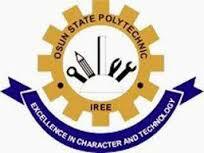 Osun State Polytechnic, Iree (OSPOLY) Compulsory Pre-Semester Examination Test Schedule and Commencement of First Semester Examination Notice for Full Time Students 2018/2019 Academic Session. This is to inform all members of staff and students of Osun State Polytechnic Iree that a compulsory Pre-Semester Examination Tests for all Full Time Students of the Institution will hold between Monday 14th and Friday 19th, January, 2019, while the First Semester Examination commences on 21st Monday January, 2019. Any student who refuses to comply with this directive will bear the risk .